These Lemon Poppyseed No-Bake Protein Bites are just what you need mid-day for a little pick me up: healthy almond, hearty oats, and protein rich yogurt make them essential in my day! This post is in part with the Stonyfield Clean Plate Club, which I am honored to be a member of. Every day at around 3:30pm, I start hitting a wall. I’m craving sugar, caffeine – anything that will help me get through the couple of hours I have left in the work day. Sadly, if I grab an ice cream scoop from the freezer or a sugar-laden coffee drink from the closest coffee shop, the crash I get after an hour is worse than the wall I’ve hit. 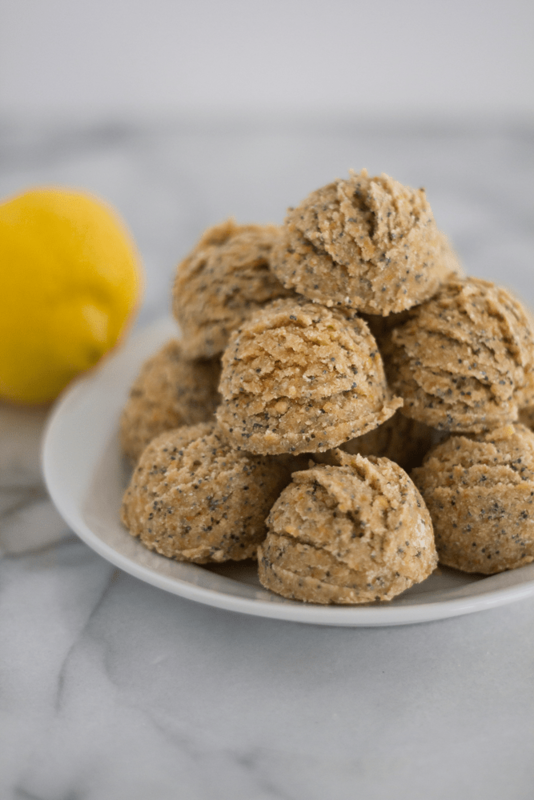 To solve my mid-afternoon drag, I’ve created this Lemon Poppyseed No-Bake Protein Bites recipe in partnership with Woodstock Foods and Stonyfield Yogurt. Using Woodstock’s Organic Lemon Almonds and Stonyfield’s new Double Cream Yogurt, these no-bake bites are packed with fiber, protein, magnesium and vitamin E. Also, almonds help lower blood sugar levels – which is just what I need during that mid-day drag! The protein from the yogurt also makes this a filling snack that will help you get to dinner without being starving. Loving the fact that the almonds are flavored with organic lemon peel, I’ve stayed on course with that flavor note and added some extra lemon juice as well as the perfect pairing to lemon: poppyseed! Just 1 teaspoon provides a measurable amounts of calcium, iron and zinc! Make these during the weekend to have on hand throughout the week – you can grab one for breakfast if you’re running out the door, snack on one mid-day as I do, or have them as a healthy dessert after dinner. Discover a protein rich and tasty snack like these Lemon Poppyseed No-Bake Bites - perfect for mid-day slumps! In your food processor, grind the almonds into almost resembling almond flour. Add the rest of the ingredients except the poppyseed and pulse until combined and a dough forms. Sprinkle poppyseed in and pulse one more time. Remove from food processor into a bowl and using a small ice cream scoop, form into half balls or roll into small balls with your hands. Place in an airtight container and refrigerate for up to a week.